On the weekend of 1–3 June, our Lead Translator Siobhan took advantage of a CPD opportunity that combined hands-on practice with the chance to socialise and network with fellow industry professionals: the annual Summer Workshop held by the Scottish Network of the Institute of Translation and Interpreting. 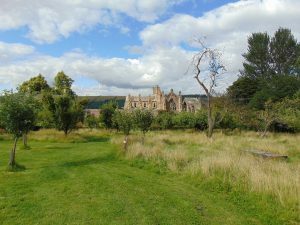 Held in the town of Melrose (whose picturesque abbey is shown on the left), this year’s focus was on client relations and establishing healthy working relationships between translators, agencies and direct clients – a subject very close to LKT’s heart. First up was the interesting case study of linguistics writer Gaston Dorren and the process of translating his 2014 book Lingo, a whistle-stop tour of European languages. Originally written in Dutch, it was translated into English and, from there, into a variety of other languages including Polish, Swedish and Spanish. Gaston explained that the translations for each market had to account for the varying attitudes to aspects of language. While the grammatical concept of case is familiar to German speakers, for example, Spanish-speaking readers required more explanation. Additionally, the translators needed to be aware of sociolinguistic issues such as perceptions of dialect: as the talk explained, a certain amount of stigma may be attached to certain accents or dialects by some in the UK or the Netherlands, but this is not the case in Norway or Sweden. It was interesting to discover how issues that arise in everyday translation work were also encountered in this more unusual project: some of the translators sent extensive lists of queries, for instance, while others queried very little or nothing at all, and there was some discussion about whether the translators who queried less ended up producing translations that were less satisfactory. As the client, Gaston’s experience therefore varied from one translation to the other – and as the author, he appreciated the opportunity to have direct contact with translators when possible. Sam Bennett, Glasgow Branch Manager at The Translation People, and veteran freelancer Helen Robertson then delivered a nicely balanced set of talks on what makes a good supplier and a good client. Sam explained that there is much to be gained from a healthy relationship with project managers at agencies, and that agencies upholding best-practice standards can help translators build long-term, lucrative relationships on key accounts. In her talk, Helen encouraged us to think about the qualities that we ideally want clients to exhibit, dividing us into groups to discuss further. On presenting our findings, it was clear that there were some common preferences: responsiveness, realistic expectations, and acknowledgement of good work or extra effort were all qualities that we valued. As each session emphasised, behind every email or phone interaction there is a living, breathing person – whether they are a translator or a client – and a little humanity goes a long way in creating the best relationships. The ITI Scottish Network works hard and plays hard at summer events, and after the day’s discussions it was time for a delicious dinner followed by some energetic ceilidh dancing – just one of the many highlights of another great summer event!